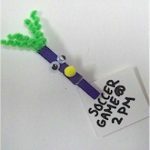 Get into the Spring spirit with this easy to make Inch Worm Clip Clip. This is an easy craft for children to make and use to reseal opened bags of treats like potato chips, cookies and crackers. Paint the clothespin. Let dry. Glue five ½” pom poms next to each other across the top. Glue on 3/16” pom pom all around the worm.